When mom returned from my Oma's, (Liselotte Haf née Kaiser-Saule ~ 1913-2010) memorial service in April of 2010, the above original photo and newspaper article were among the many photos and documents mom hand carried back with her. My Oma had a treasure trove of family history I hadn't seen before and I am so grateful that mom brought the entire box of all these treasures to me before she passed away in July of 2010. For the last four years, I have wanted to know what this newspaper article said . 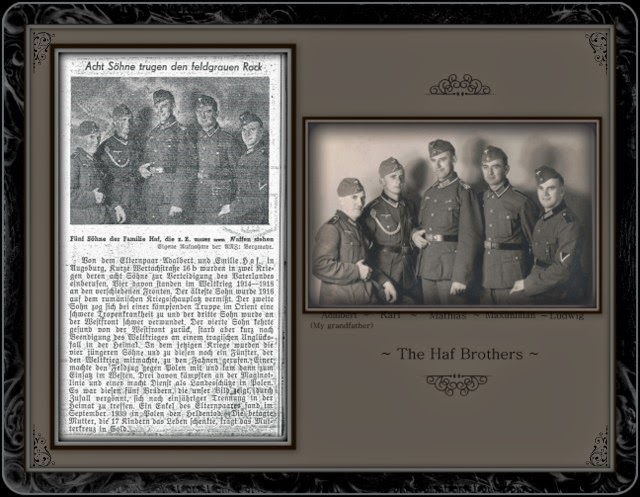 . . thanks to a wonderful kind friend and blogger, Barbara Schmidt over at Barbara Schmidt - Genealogy - Ahnenforschung - Family Research - Corporate History, she offered to translate this newspaper article for me . . . thank you so much Barbara! 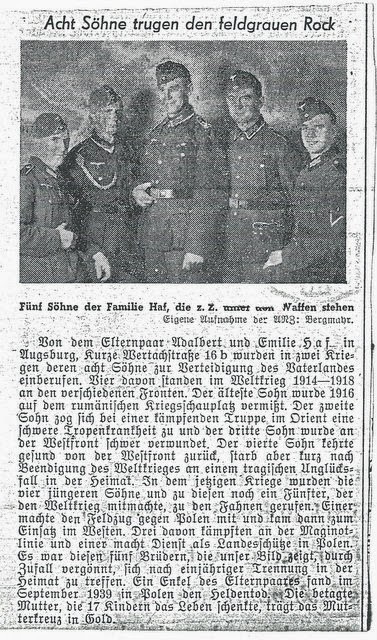 The newspaper article is about my grandfather, Adalbert Haf ~ (1907-1968), his family, his brothers, the Great War and WWII . . . the loss of many of his brothers in the family due to the war. Mom had told me that there were nineteen children in the family . . . two of which I believe may have died at birth or were miscarried. My guess and I do not know for sure, that this may have printed in the local Augsburger Newspaper. There is no date or name of newspaper. Below the photo ~ Five Sons of the family Haf, which are under weapons right now. 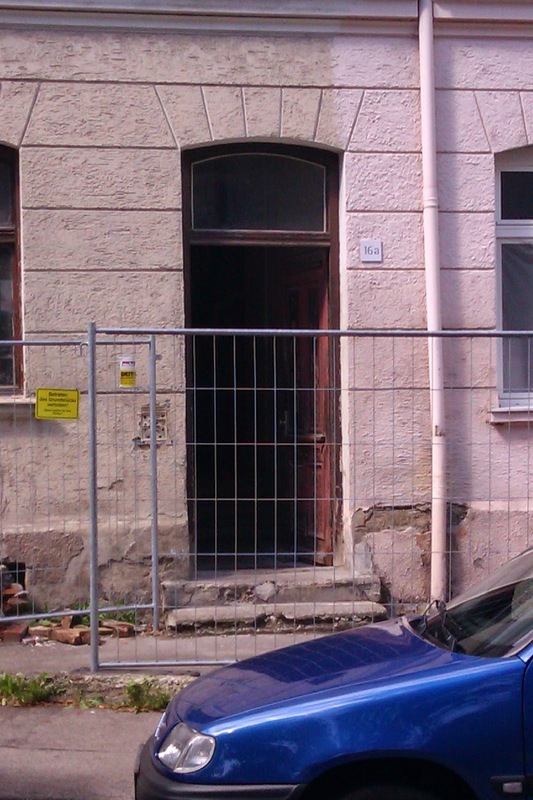 Eight sons of the parents Adalbert and Emilie Haf, living in Augsburg, Kurze Wertachstrasse 16b (that's the address), have been enlisted for defending their fatherland in 2 wars. Four of them stood in the world war 1914-1918 at different fronts. The oldest son went missing 1916 on the Romanian battlefields. The second son contracted a heavy tropical disease with the fighting troops in the Orient and the third son got gravely wounded at the west front. The fourth son returned healthy from the west front, but died shortly after the end of the Great War of a tragical accident back home. In the current war the four younger sons and a fifth who already served in the Great War were called to the flags (meaning: called to the troops). One was part of the crusade in Poland and afterwards went on the mission west. Three of them battled at the Maginot-Line and one is serving as a shooter in Poland. Those 5 sons who are shown in the picture above were brought together by a coincidence in their hometown after being separated for a year. One grandchild of the parents suffered the heroic death in September 1939. The aged mother, who gave birth to 17 children, carries the mother cross in gold. Even though the article does not mention names (and how I wished it did), I gleaned so much information from one newspaper article that I didn't know before. I am currently working on a book for my Haf-Kaiser (maternal) side of the family . . . German research is frustrating and difficult to say the least but I am learning so much about my family . . . this article and photo will happily fill several pages of my book. It's Genealogical Random Acts of Kindness such as Barbara helping to translate documents like this, that help discover the stories and events that happened in your ancestors lives . . . thank you again, Barbara! 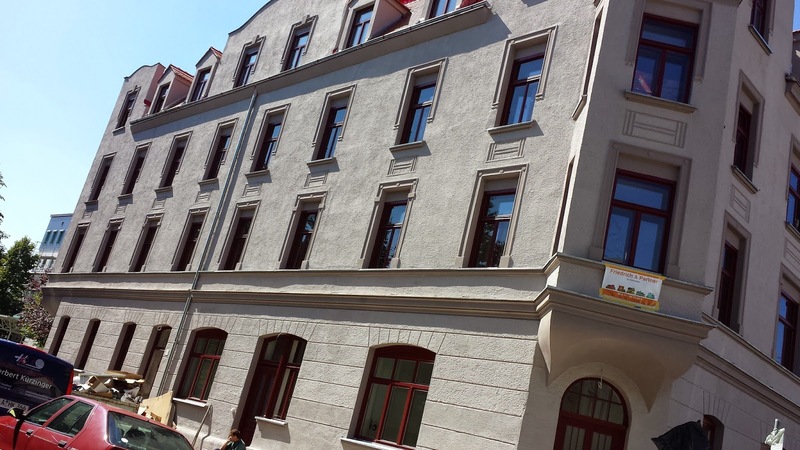 From this article, I also discovered that my great grandparents, Adalbert (1868-1952) and Emilie Haf (1871-1944) lived in the same building that my grandfather, Adalbert, my Oma, my mom and her brothers lived in on Kurze Wertachstrasse 16a . . . and I was born at that address. I was able to see this wonderful building when mom and I visited in 1967 . . . Oma resided there until she went into a nursing home. Photos taken by my cousin, Marion ~ 2013 ~ Thank you, cousin. I finally got it out there! It's because of you that I learned some wonderful information . . . I so appreciate your time and help. How thrilled you must have been to finally get the transcription. If it had been mine, I would have kept at it for as long as it took. 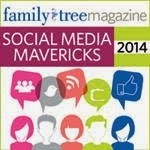 Very interesting, but sad all the deaths mentioned. I sure was Barbara . . . Barbara Schmidt was so kind in offering to help me as I have such a hard time with German (seems a bit odd as I was born there!). Thank you, Jana . . . I feel very honored!